Photo courtesy of AROTC Cadet Public Affairs. 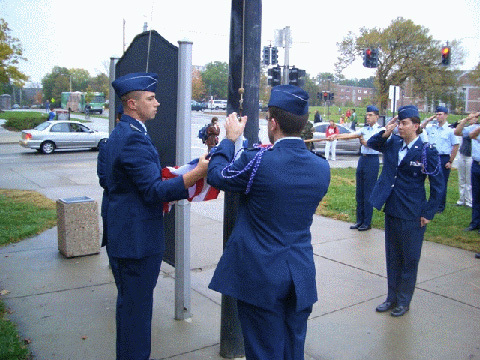 Air Force cadets fly a flag donated by UNL alumna Lt. Col. Linda Christiansen during a formal ceremony on Oct. 21 outside the Military and Naval Science building. Susan Rosowski, Adele Hall Distinguished Professor of English, died Nov. 2 and was buried in a private family service. Memorial services for Rosowski, an internationally known scholar of Willa Cather, will be planned in the next few weeks. With more than 100 faculty participants, UNL's Peer Review of Teaching Project has reached a milestone: The Anchor Press has contracted with the directors of UNL's project to write a book on Nebraska's project model. UNL is one of 33 U.S. colleges and universities selected to host a Fulbright visiting specialist from one of the world's many Muslim countries to expand understanding of Islamic societies and cultures. Oxygen: We can't live without it, and neither can most other organisms on Earth. For most of the planet's history, however, very little oxygen was available, and as a result, life was neither widespread nor diverse until the Cambrian explosion more than 500 million years ago, some 3 billion years after the earliest fossil records of life. Roy Gutman, foreign editor at Newsday, will speak on "Afghanistan and Lessons Learned" at 3:30 p.m. Nov. 8 at the Lied Center for Performing Arts. The lecture is part of the 2004-05 E.N. Thompson Forum on World Issues and is free and open to the public. The frantic pace of the recent Election Day has especially been felt by UNL's Allan McCutcheon, who was one of 12 national experts who gathered in Somerset, N.J., to collect election results and pass projections on to electronic and print media earlier this week. Smoking in public isn't a new issue to Lincoln, as this cartoon indicates. With the city ordinance banning smoking in Lincoln's public areas on the ballot this week, we thought we'd share a cartoon to show it was a contentious issue even 100 years ago. A vocalist who defies musical labels, Emmylou Harris has earned a place in music history with her storied career and 11 Grammy Awards. Harris will perform at 7:30 p.m. Nov. 10 at the Lied Center for Performing Arts. This concert was originally scheduled for Nov. 16. New Museum exhibit allows for a "Walk Through Time"
Sharks, dinosaurs and rhinos don't come to mind when most people think of Nebraska, but they all have a common history in this part of the country, as illustrated in "A Walk Through Time," a new ongoing exhibit at the University of Nebraska State Museum. International news has changed how some look at the large head sculpture on the Sheldon Art Gallery's stairs. Fallen Dreamer's artist, Tom Otterness, will speak about the dynamics of our political world and the role art plays in our public consciousness during these tumultuous times. His lecture begins at 5:30 p.m. Nov. 9 at the gallery. This event is free for students, $3 for Nebraska Art Association members and $5 for non-members. for information, call 472-2461. The UNL School of Music will present the opera Madama Butterfly by Giacomo Puccini at 7:30 p.m. Nov. 10 and 12 and at 3 p.m. Nov. 14 in Kimball Recital Hall. Gardeners: What's your favorite book? Spring Affair News wants to hear from gardeners about their favorite books from any genre. Send no more than 75 words about yours by Nov. 20 to Karma Larsen at klarsen1@unl.edu. For information, call her at 472-7923 or visit http://springaffair.unl.edu/.